During the hot, dry conditions of summer, wild birds will continuously look for reliable sources of water. Water is crucial to birds, sometimes more than food. Water is vitally important when it’s extremely hot, because birds do not sweat and must remove excess body heat through their respiratory system. So, when temperatures rise, birds’ respiration rate increases, sometimes to the point where they can pant like a dog. This activity dehydrates birds. A reliable source of water also allows birds to bathe regularly, a critical part of feather maintenance and staying in top-flight condition. However, offering water does not have to be difficult or expensive. 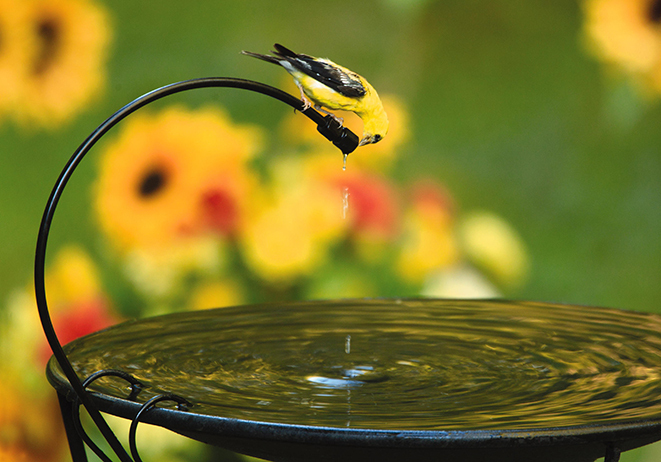 Attract more birds by offering water in a birdbath. These water sources are normally elevated to protect birds from natural predators. Birdbaths with sloped sides permit visitors to move from shallow to deeper water, and they accommodate different sized birds that need to drink or bathe. Some people use misters to provide birds with water. When located near foliage, misters give birds the opportunity to “leaf bathe.” Birds exhibiting this behavior will flutter against wet plants or leaves to release droplets onto their feathers. Open sources of water, such as birdbaths, can cause a potential mosquito problem. For this reason, many people use a Water Wiggler, an agitator that creates ripples in water (mosquitoes cannot/do not lay eggs in moving water). Also, water in motion is far more attractive to birds than a stagnant pond. “Water is essential to bird survival and many people see that necessity as an opportunity to be entertained by the birds. 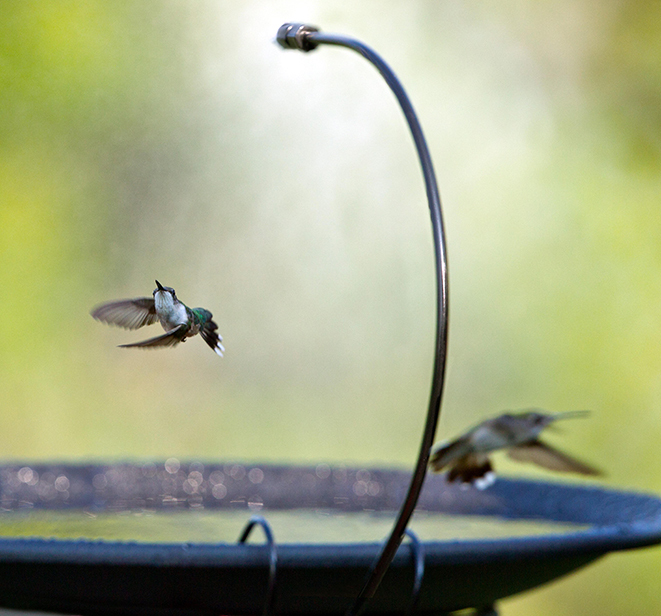 Consider adding a water feature to your yard to attract a greater variety of birds. Visit your local Wild Birds Unlimited store to see all the options discussed here today. Wild Birds Unlimited is part of the original and largest franchise system of backyard bird feeding and nature specialty stores with more than 280 locations throughout the United States and Canada. Wild Birds Unlimited specializes in bringing people and nature together with bird feeding and nature products, expert advice and educational events. Visit our Web site and shop online at www.wbu.com. To learn how you can open your own Wild Birds Unlimited, visit www.wbufranchise.com.